Feels like Hyper Duel...man, i miss that game. Time for a Mecha-themed shmup review, and no other shmup fits the bill better than Stardust Galaxy Warriors: Stellar Climax, which at first it looks like a clone of Tecno Soft's Hyper Duel, but that's only what it seems to look like, because things can be really different as soon as you begin the game. ¿Does Captain Falcon pilots this machine? BLUE FALCON: Not the F-Zero car, the Blue Falcon is the "Ranged Artillery" type robot appropiate for the beginner player, since its focused on long range shooting from cannons and homing missiles. 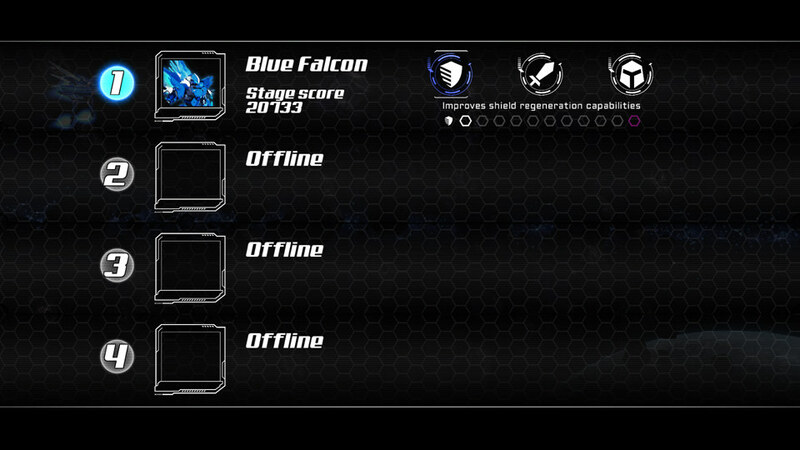 The Blue Falcon's Special Move is the Photon Javelin, which fires a spear in the direction given by the controller. The Distortion Technique is the Falcon Barrage which unleashes multiple homing missiles which inflict great damages to your enemies. RED TIGER: This "Melee Berserker" is your Close Combat specialized type machine. The Red Tiger's Special Move is the Power Paws, which makes the robot go into a non-stop Wolverine-like slashing, however, each slash pushes the player forward. Its Distortion Technique is the Tiger Instinct, which slows the game speed like the fully charged Crystal Hunter from Megaman X2, the Witch Time from Bayonetta and the Climax mode of After Burner Climax. SILVER WOLF: Known as the "Hit & Run Dasher". The Silver Wolf's Special Move is the Sonic Dash, which warps the robot to any direction indicated by your controller and damages any enemy that passes through, just like the Zero Teleport from Alien Soldier. The Distortion Technique is the Stardustium Bomb, which is your traditional half-screen covering bomb that damages enemies, unfortunately, doesn't destroy bullets. BLACK BEAR: The "Defensive Support" made to take more abuse than the rest. The Black Bear's Special Move is the Graviton Barrier, which is your "Frontal Shield" that protects your robot from bullets, but also deflects them back to your enemies. For its Distortion Technique, the Black Bear has the Aegis Field, a full circular "Force Field" which protects the unit for a short time. AMBER FOX: The "Offensive Support" robot. It's Special Move is the Naked Singularity, which is a chargable Hadoken-like energy blast. Its Distortion Technique is the Vulpine Pulsar, which is your time stopper in the style of Mao-Mao's F-15 E-Wave from Aero Fighters. However, the Vulpine Pulsar will paralyze the on-screen enemies, but it doesn't stop the game from scrolling which means it will add more enemies if you're not careful. All robots use a "Primary" weapon and a "Secondary" weapon which acts as the sub-weapon, despite their features. This increases the possible robot/weapon combinations. PRIMARY WEAPONS: The Force of Arms of your machines. A selectable variety of guns for the ultimate display of power. Vajra 75-ZS: This "Pulse Rifle" is your basic laser weapon with rapid fire and efficiency, delivers some slight damage, but its a good start for beginners in this game. Taranis LB-02: This "Plasma Shotgun" fires a burst of bullets that deals considerable damages, but with a slightly slow fire rate, around half a second per shot. Caladbolg HRF-03: The "Chaingun" type, Your basic machine gun that fires a rapid stream of bullets in a linear pattern. Fafnir DRG-0: No shootout is complete with a Flamethrower. If Contra III The Alien Wars, Alien Soldier and Gradius V had one, why not Stardust Galaxy Warriors? The Flamethrower fires a short-ranged jet of flames which inflict constant damage but it's strength is quite weak. Vijaya XR-03: This is "A Certain Shoot'em Up Railgun". This weapon fires a long laser beam which inflicts great damages, but with a quite slow fire rate of 1 shot per 1.5 seconds. In terms of rapid fire, it's more of a "A Certain Videogame Failgun", but its strength is something to consider during boss battles in this "Certain Armament Index". Banshee 88-U: This "Pulse Emitter" fires "Moon Crest" shaped beams like the Styx Wave Shot from Thunder Force III. It deals acceptable damages, and it has a good range since the beam grows in size as it travels through the screen and splits in a smaller beam when it doesn't completely hit something. Avenger ASC-01: This "Laser Cannon" fires a basic three way shot of a small spread, but with constant damage output. SECONDARY WEAPONS: "Fire and forget", The secondary weapon ranges from Missiles to Grenades. Seraph MK.2: This is your basic Homing Missile which can be compared with the Phoenix and Falcon Missiles from U.N. Squadron. The Seraph seeks its targets. Leviathan 404-NF: This Proximity Rocket is the "Straight-and-Explosive" type which fires rockets that explode near targets, pretty much like the "M" Missile from Raiden, but much faster. Vulkan MG-30: The Flare Launcher, it fires five green missiles that slows enemies down. Mizuchi 303-DM: The "Torpedo Launcher" type weapon, fires a incredibly powerful torpedo, it's only flaw is the inaccuracy of this projectile as a linear shot, so it requires practice and aiming for inflict serious damage to your enemies. Manticore 202-HW: This "Needle Projector" fires a small curtain of bullets that goes more straight than spread, but also they're quite weak. Mjölnir VG-08: A "Particle Beam" which fires a straight orange thunderbolt, which replaces the use of missiles. Hecate 90-X: The "Grenade Launcher" type. It fires a purple orb of energy that explodes after traveling a considerable distance or hits an enemy, dealing great damages, just like the Grenade from Super E.D.F. Earth Defense Force. The Distortion Techniques are the "Bomb" of the game, the only flaw is you can only carry one of them, so if there's another Distortion Charger item, you'll have to drop the bomb to pick the item. There's other additional items in this game. Turboshoot: The "Power-Up" of this game, this increases the overall damages of your Primary and Secondary weapons. But it suffers the Aero Fighters/Turbo Force Syndrome because the Power-up is only temporary. Bullet Frenzy: Works basically the same as the Turboshoot, but it focuses on fire-rate acceleration. Photon Drone: This drone fires homing blasts of energy, working as your temporary Homing Missile Launcher. Death Blossom Drone: This drone fires a 3 directional shot combined with a 360° rotation, resulting in an efficient all-range killer. Acid Drone: The "Corrosive" damage dealing weapon. It fires a ball of acid that brings constant damage after impact. Anti-Matter Drone: This drone has the same weapon as the Hecate 90-X projectile. A grenade that explodes after hitting an enemy, causing additional damages on the blast radius. The first thing that you'll notice with the controls is they're different from any other game. By pure instinct i pressed "A" thinking i'll shoot, but instead i activated the Sword Melee. So that's when i learned this game has an entirely new control scheme, not too difficult to learn, but its something different than the traditional shooting stuff. Left Trigger: Fires Secondary Weapon. Right Trigger: Fires Primary Weapon. L Button: ¿Got tired of holding the Trigger?, The L Button toggles the Secondary Weapon from manual to "Autofire". R Button: Toggles the Primary Weapon to its "Autofire" mode. X Button: Activates the Special Move by holding the button. A Button: Uses the Sword Melee. Using the Trigger buttons to shoot and the basic buttons for melee kinda reminds me of FPS games like the Halo and Gears of War series. 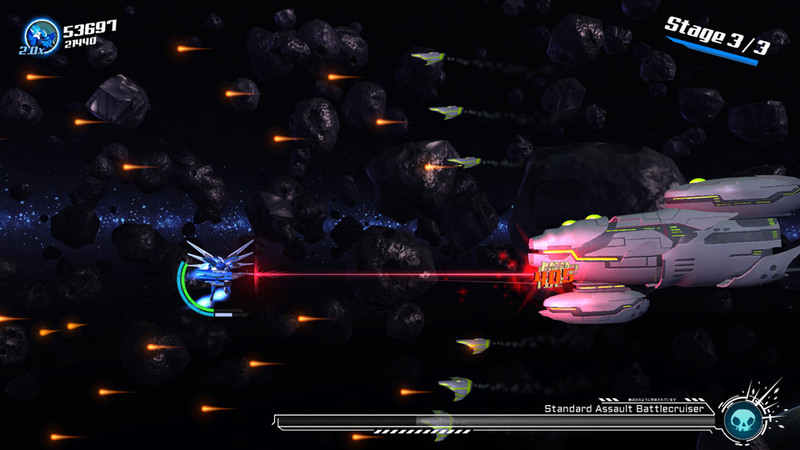 But it is nice to see the use of close range combat weapons in a shmup, just like Astebreed and Brave Blade did. Also, they add a new element of challenge, and that's the score obtained by destroying enemy ships. For example, destroying a small ship with your Primary Weapon will give you 150 points, while the Melee attack will give you 500 points, and combined with a combo-like sequence you can get 1000 or more. Also, destroying enemies without getting hit will increase your score multiplier up to "x2.0", increasing your bonus capacity. My strategy: Increase your Shields, Life and Weapon damage, the other upgrades are irrelevant. There's two "Shops" in the game. The first one is the "Free Upgrade" for clearing one part of the Stage, giving you the option of upgrade by 1 point any of the 3 available status such as Shield, Overall Damages or Bonus possibilities. Each stage is divided in 3 segments, so you'll have 2 "Upgrade Point" shops. "20,000. ¿Isn't that a little steep?... If 20,000 would save your life i say that's a sweet deal." 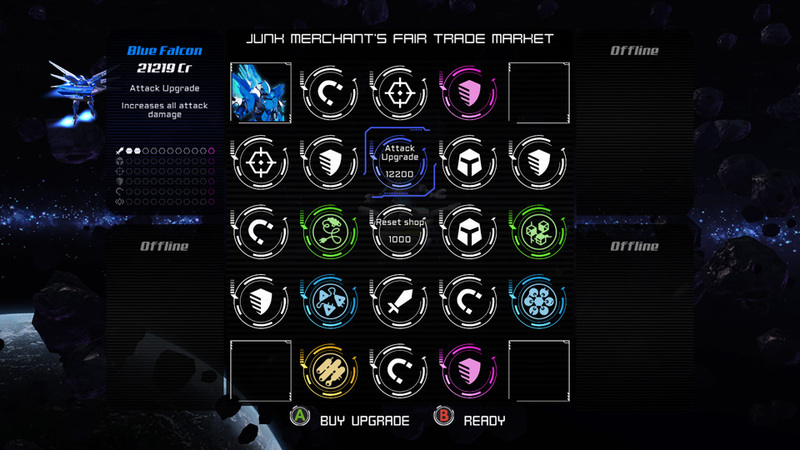 The second Shop is the "Junk Merchant's Fair Trade Market" which appears at the end of the third segment of the stage. This is the typical U.N. Squadron's McCoy's Storehouse where you can buy more than one item. The only problem is the prices can be a little expansive, being 10,000 Credits the cheapest and 30,000 the most expensive, and accumulating money isn't the same as scoring since it doesn't give you the same amount of points. So, you're gonna need to rely on Melee attacks more often than simple shooting things. Fortunately, you'll get extra credits after clearing the stage just like in U.N. Squadron, however, the reward is based on your performance, so it will constantly vary. Along with the FPS-like control scheme and the shops, the game includes RPG elements like HP, Shield gauge and even side-effects like corrosive damage and critical hit damage to enemies (500 points could turn to 1510 for example). Multiplayer features the option of reviving players which is more like the Rewind in Double Dragon Neon since it takes some time to revive your fallen buddies instead of an instant reswpan like parrying the defeated player's ghost in Cuphead. But this is essential specially when the game only gives you one life to complete the stage just like in Steel Rain X. If you die and select Continue, you can restart from the beginning of the segment where you died rather than starting the whole stage again. After completing the Campaign, the game gives you the "New Game+" option, allowing you to start from the beginning carrying all your upgrades, just like the latest Ace Combat games. Challenges is the second mode of this game and includes some special missions like destroying enemies in the fastest time possible to avoid losing points, bullet dodging, fighting bosses and dealing with side-effects and even a campaign-like level in a Christmas-themed level. Gauntlet is a "Survival Mode" that features 11 selectable levels, with customizable game rules from presetted to the "you-make-the-rules". In this mode you have to survive as long as possible with your weapon configuration. It's the Steamboat Willie of the future. ¡¡Shoot it down at once!! 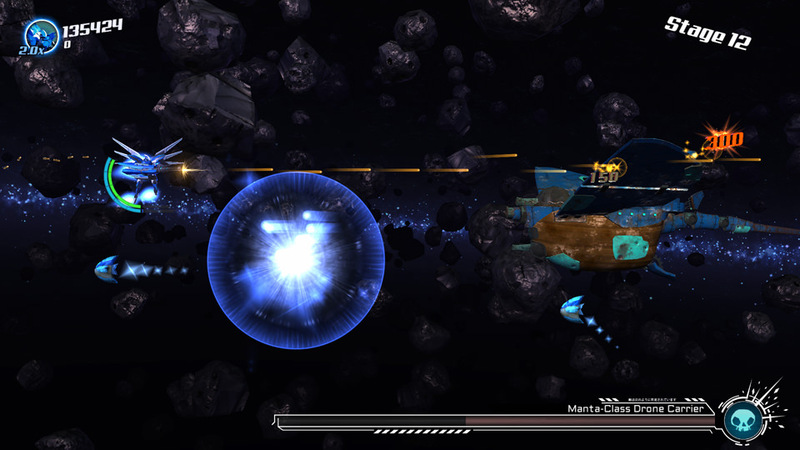 While the character and player mecha designs is obviously anime-style from titles such as the Persona series, Rahxephon and Mobile Suit Gundam, the enemy design is a blend of anime and cartoon designs like wooden ships with robotic features, and even fantasy things like a talking asteroid in the first mission and his child with a kiddie cap who appears later in the game. All of that makes me think of Aero Fighters and its wackiness. The best way i can resume the character and enemy graphics is by calling this game "Aero Fighters with Robots" or "Aero Fighters meets Hyper Duel". In addition to the wackiness of the enemy design, there's a Christmas-themed stage where you fight against a Christmas tree shaped dreadnought which would fit quite right in Parodius and Otomedius. 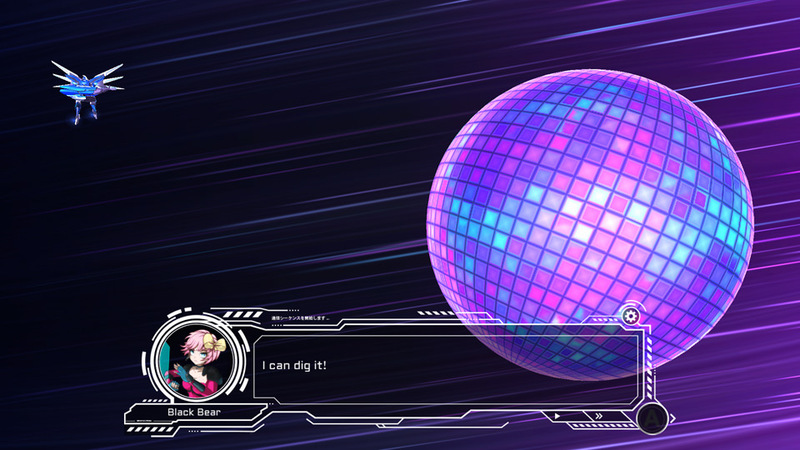 If all those wasn't crazy enough, there's a Disco Ball as a boss in this game. If you thought Raiden IV's Horda Gardia wasn't too much of a Space Disco Ball, this game takes that on a more drastic level. I think this would be a better game if you were trying to destroy a giant disco ball. Yeah, the storyline is that disco is coming back and you gotta stop it. It would be called "Disco [Expletive] Yourself", but now I'm just thinking out loud. The only complain that i have with this game is the lack of identity of the pilots, that's right, they don't have a name of their own 'cos during the dialogues they use the name of their robots (a girl named Black Bear doesn't sound right), only their boss, Archibald Stardust and Gundula are the only characters with a name. While the gameplay has a blend of U.N. Squadron and Hyper Duel, the graphics are Mecha and Fantasy at the same time, the music has a Megaman vibe on it, feeling like a spiritual successor of the classic Megaman games. For instance, the second mission of the campaign has an excerpt that sounds like a remix of Bubbleman's stage from Megaman II. The "Operation Bugfix" stage features a trumpet fanfare that evokes the music from the first Sigma stage of Megaman X, all of that blended with what it sounds like the successor of the 16-bit era "Capcom Guitar" heard in SNES games such as U.N. Squadron and Taito's Darius Twin. I guess the composer REALLY wanted to work at Capcom, 'cos it has the potential of making great shmup music, and Stardust Galaxy Warriors: Stellar Climax is a proof of that. 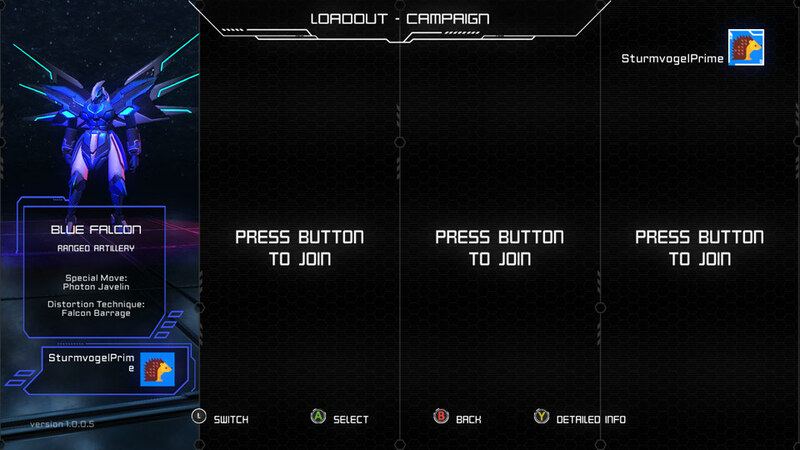 There's voice samples in the game, but they're very, very few: 5 for the robot names, Stage Clear and Select Upgrade. I think the game deserved a little more. - The robotic head that appears during the Autosave and Stage Clear screen looks suspiciously similar to Starscream from Michael Bay's Transformers movies. - Silver Wolf's pilot quote "Back into the breach!" in the Abyssal Wreck stage could be a reference to Pacific Rim. - Archibald Stardust's quote "Something really big is approaching, fast!" in Operation Bugfix could be a possible nod to Darius. - The Hive Queen's nickname "Lady Jigglyfluff" given by Gundula might be a reference to the Pokemon character Jigglypuff. - The achievement "Disco Go Funk Yourself" might be a nod to the Angry Video Game Nerd's disco reference on the "Star Wars Games" episode. Is there any way to describe Stardust Galaxy Warriors: Stellar Climax?, Well, it's basically another U.N. Squadron wannabe just like Steel Rain X, but with Robots, minus the use of Kaoru Shintani's Area 88 license. Quite simple, but satisfyingly fun to stay on your XBOX One, PlayStation 4 and PC.